We started off selling our black and white club logo as vinyl car stickers at £2.00 each. This raised £250.00. 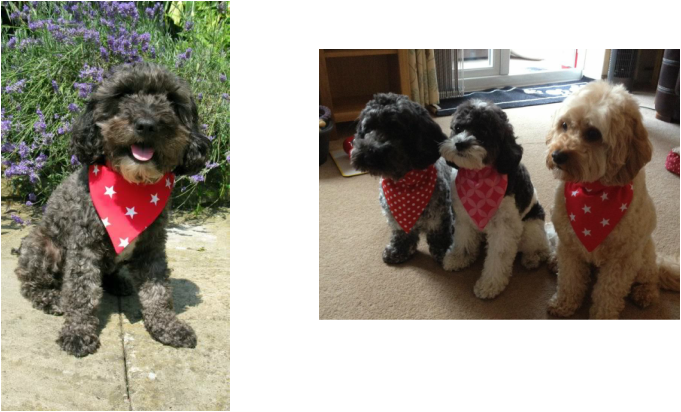 We then sold handmade reversible bandanas in a variety of fabrics. This raised £157.19. Followed by an online competition "money in the jar" where people had to guess how many 1p and 2p there were at only £1 per guess. The prize was a fantastic selection of dog toys and treats and the winner was Biggles owned by Anne Waugh. The competition raised £124.00. In November we had a Bingo Night, where there were various prizes on offer. The evening also included nibbles and a talk by Hearing Dogs for Deaf People, where the owner brought along her dog Saxon and everyone got to meet the dog and find out how important they are to their owners. The night was successful and raised £603.71. 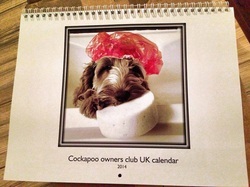 Our next fundraiser was selling our very first Cockapoo Owners Club Calendar. Members were invited to send in photographs and then these were sent to the printer who made his selection. All proceeds went to the Hearing Dogs for the Deaf : £670. Our final event for 2012 was selling Dickie Bows in black , white and red for the male dogs and yellow and pink bows for the girls and raised £98.15. In March 2013 we held an Easter Competition to win a selection of Thorntons Chocolates. Member sent in photos of their dogs which best represented Easter. Lots of fun was had,and we also had members who didn't send in a picture but donated instead and we raised £305 for Hearing Dogs For the Deaf. The winner was Fudge owned by Nareen who was such a sport as Fudge was an angel being dressed up as an easter chick which was the winning photo and a Rabbit and an Easter Egg. Members got behind Nareen and Fudge and we had the save the Fudge fund, where by members donated money to stop Fudge from being subjected to further dressing up. All in all a good time was had and all the entries can be seen in the Slide show on our Members Section. April/May 2013 we held a fun photo comp where members had to dress their dogs up as either a celebrity, famous person or character and could also include themselves. The entries were brilliant and had us all in stitches and can be seen on the slide-show in members Section. 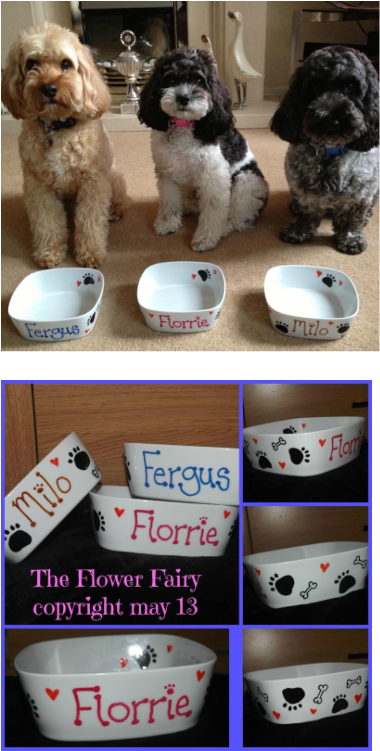 The prize was a hand painted bowl for your dog , kindly donated by Karen Flower Fairy. Lynn loved them so much she bought Milo and Fergus one. July 2013: We held an online auction on our facebook page where members donated goods to be auctioned and then members bid on items. It was great fun, especially when a bidding war broke out over the toy beanies! 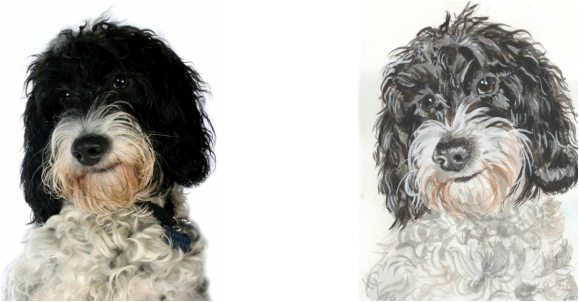 The auction raised a fantastic £491 for Hearing Dogs For Deaf People, thanks to all who donated and bid. 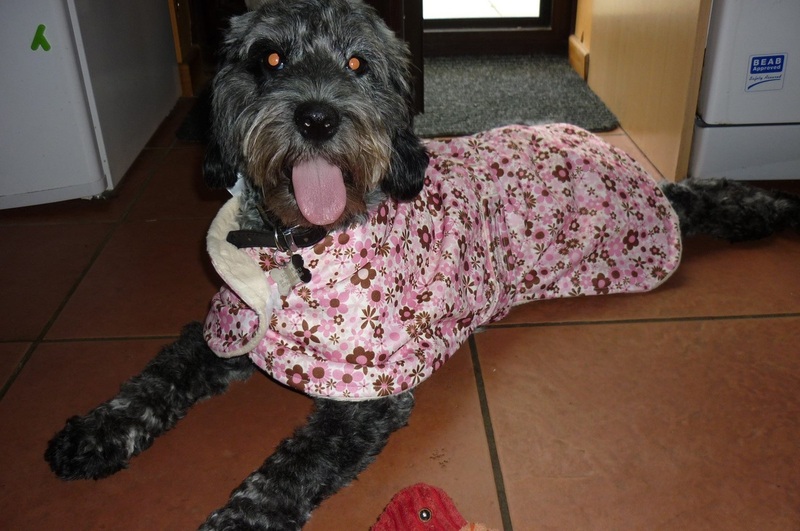 Here is Molly wearing a handmade coat she won in the auction, kindly donated by Kirstie Blackwall. 3rd Aug 2013: Karen Farmer and Debra Blackburn held a collection day at B&Q Lincoln, where Hearing Dog Saxon and his owner Christine attended. A great day was had and all the dogs loved all the attention they received..along with a cupcake sale they raised £193.00 Well done to all involved . What a lovely day was had by all at the Summer Poo Picnic at Wendover Woods in Bucks with the Poofaxtor comp and walk in the woods to end a fab day. We started off with the Poofaxtor Comp where there was 9 classes. It was great fun to watch the dog tricks and the dog who could eat an egg the fastest with Riley being the winner. It was neck and neck with the fastest recall where two dogs tied, so Coco and Brandy had to do it again and Coco won, but was a very close win and much fun. The Fancy Dress class brought much merriment to us all...with even owner Nicola joining is as Wallace with her dogs dressed as Gromit and Shaun the sheep! Next we had a lovely raffle with prizes kindly donated by members of the club and some businesses, must say some of the ladies were getting very excited on the sidelines in anticipation of the numbers being called lol. The day ended with a nice walk through the woods and then home for us all to take a well earned rest. Happy owners and happy poos! Well done to all involved and all who turned up to enjoy the day. We held a photo competition on our clubs facebook page for photos of Snoozy Poos to win some flowers and wine from Next, kindly donated by club member Wendy Mulela,and the response was overwhelming. We had over 100 photos entered and judging the competition was very very hard. In the end we decided the winner was this lovely mum and her cockapoo puppy Henry asleep under her ear sent in by Henry's owner Niki Smith. We had two runner ups who each will receive a Club Logo Car sticker..Murphy ownerd by Anne Malone and Chester owned by Mark Shaw. A big THANK YOU to all who entered, this was our best photo competition to date and we raised a staggering £246 for Hearing Dogs For Deaf People. Here is the winner and runners up and a slide show of the other entrants. We held a Halloween Photo Comp raising £96. There were lots of fab entries and was such a giggle and we all felt the dogs did so well to be dressed up and for the owners to be able to get good photos of them. 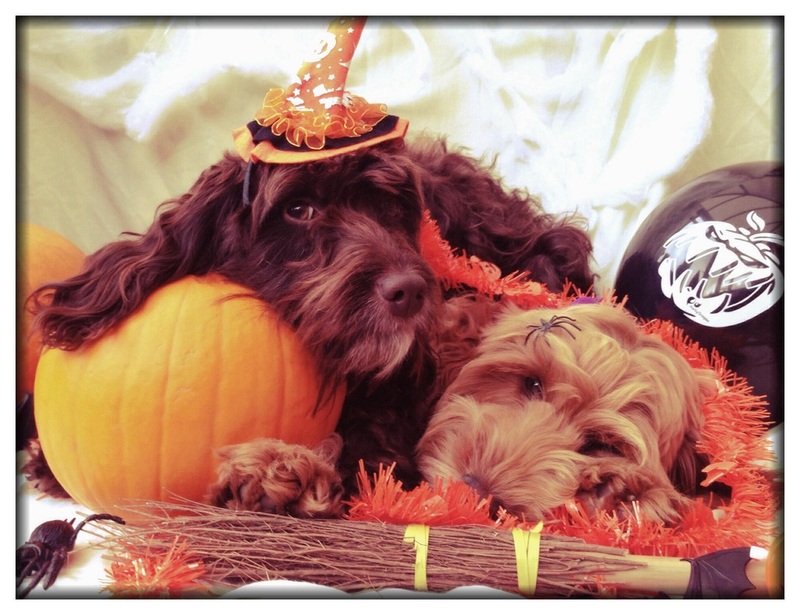 The winner was Sharon Wane with her wonderful autumnal Halloween photo who wins a signed framed copy of the Cockapo Cartoon from Rupert Fawcett from Off The Leash. 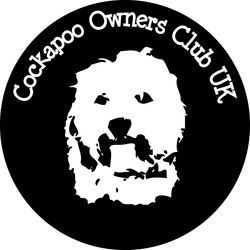 On Sunday the 8th December we held an online quiz night with the winning team each winning a Cockapoo Owners Club 2014 calendar, kindly donated by Sharon Wane and runner up team each winning a tuggie toy kindly donated by John Donnelly. Much fun was had by all. We raised £144.20. Thanks to all who took part or donated. Club members Sue Marshall and Keren Green ended our 2013 year of fundraising with a £135 donation from Sue and a £50 donation from Keren. Sue contacted us earlier in the year to say that each year she donates 10% of her Xmas sales as a Kleeneze Distributor to charity and this year she chose the Club and Hearing Dogs For Deaf People as her chosen charity. All monies for the above fund raisers have been paid into the clubs Just Giving Page and have gone directly to Hearing Dogs For Deaf People.